The Scottish Caravan, Motorhome & Holiday Home show makes a welcome return to Glasgow’s SEC from 7 – 10 February 2019. Sponsored by BC Motorhome, it’s the largest exhibition in Scotland and the perfect setting for visitors to see thousands of products and get all the ideas & inspiration for their next adventure.Taking over the entire SEC Centre, visitors can explore the widest selection of caravans and motorhomes from the UK and Europe’s leading manufacturers and dealers. Brands on show include Elddis, Swift, Lunar, Bailey, Compass, Freedom, Autocruise, Rollerteam, Hymer, Coachman, Knaus, Rapido, Autotrail and Autosleeper. The extensive range on display includes the latest and most popular models and has something to suit all tastes and budgets. Visitors will also have the opportunity to step inside their dream holiday home with a fantastic selection on show from luxury lodges to quirky eco pods. 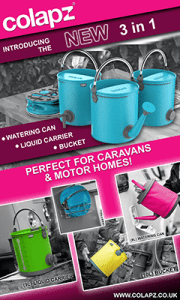 The major Clubs and Associations will be on hand, together with a number of holiday parks, to provide you with all the information and advice on the fantastic locations to holiday across the country.For those looking for the must have accessories and awnings, the Accessory Superstore will be bursting with gadgets and essential products for every tourer. The Camping Village will return with a range of the latest and favourite family tents, and there will be marine products on show including jet skis and dinghy’s as well as a selection of marine accessories. All this plus a fabulous Farmers Market with market stalls selling a selection of products. The show really is the perfect destination for outdoor enthusiasts or those thinking about touring for the first time. Experts from The Caravan & Motorhome Club will be offering FREE tuition so if you’re an experienced tourer looking for a refresher or new to touring and want to learn how to tow or manoeuvre safely then bring your driving licence and sign up on the day from the Club stand. (subject to availability)What’s more visitors can take advantage of fantastic show only offers and discounts, not to be missed! Tickets are on sale now and by booking early you’ll save on entry! Kids under 16 go free! To find out more information see their social media outlets.